Get Our 2.4x2.4m Marquee Tent Custom Printed With Your Logo! 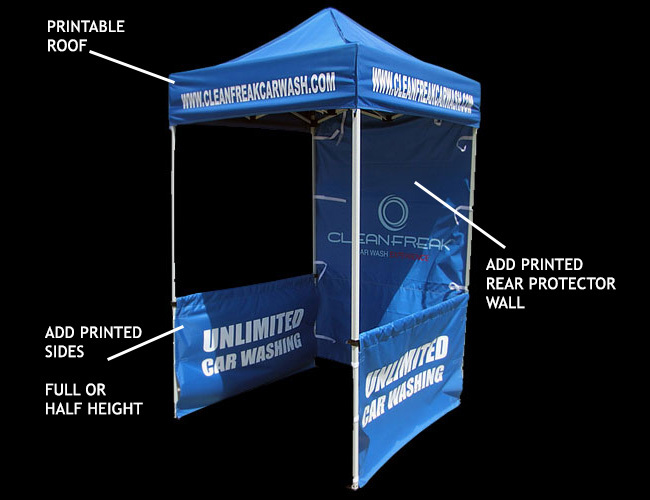 Promotional marquee and tent displays are the ultimate in big advertising! with your branding emblazoned accross all panels these popup displays are brilliant for outdoor events, carnivals and promotions. Each leg also features a rotating cam lock to snap the frame into the desired height. The unique design of these locks eliminates sore fingers because they can be turned rather than pulled to release the structure. Every tent canopy includes a carrying bag to house the alluminum finish frame and components during transportation. Marketing and sales play an important role in the success of any company or product. Unless you publicize nobody will come to know about your product. Instead of going door to door and explaining about your product, simply put up a stall in a mall or at strategic locations where you feel people can get to know about your product/ company. Hiring a place costs a lot of money and not everyone can afford it. Moreover you need a place only on a temporary basis. So the best option is to put up a marquee tent at a crowded place to advertise your product. Be it a promotional event or a beach occasion printed marquee tents are a must have. This tent acts like a house and offers shade and also is easily dismantled. Just carry it in the bonnet of your car and mount it wherever you want. It offers protection from the sun and also allows you to sit in comfort and publicize your product. Some of the tents also have plug points so that you can keep a computer to showcase your products. There are cam locks that provide easy set up times at desired height and power coated framework. Along with the tent comes a brochure that explains how to put the tent together. Rods and screws are given so that you first screw the skeleton together and mount it on the ground. Then the tent made up of sturdy cloth (canvas) that can withstand rain and wind is placed on top of the frame completing the tent. It weighs less and is easy to carry along. Advertising your product is utmost important and so you can even get your company and product designed on the canvas. The printing is done using laser technology and so the design and writings can withstand the rain. These pop up displays are perfect for outdoor advertisements, carnivals and events. The frame is made of anodized aluminium so that it is light to be transported. The material is long lasting and offers comfort to people who walk in and out of it. There is safety as the frame is sturdy. The back of the frame work is made of non breakable, high quality nylon plastic accessories and joints with heavy duty reinforced ribs. This holds the frame together tightly. The tent material is UV, water and fire proof. It is very easy to assemble the 3x6 printed marquee tents as it pops up in less than ten minutes. These tents are available in three sizes and also in different patterns. A simple roof/ canopy along with side and back covering are ideal for all events. 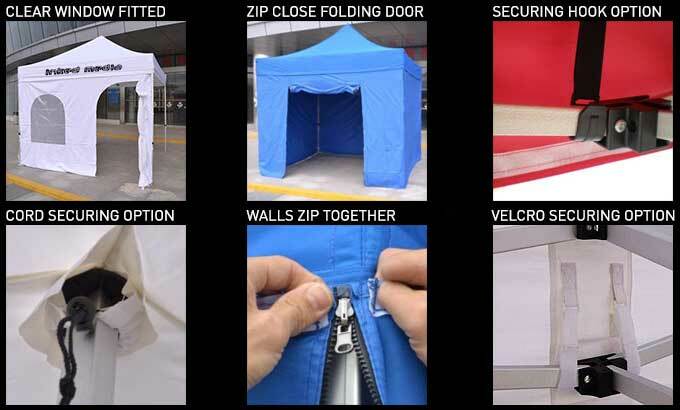 In case you want a house type of tent, it is available with zip that opens up and automatically positions itself on the frame in house shape. This gives privacy to the people sitting inside. 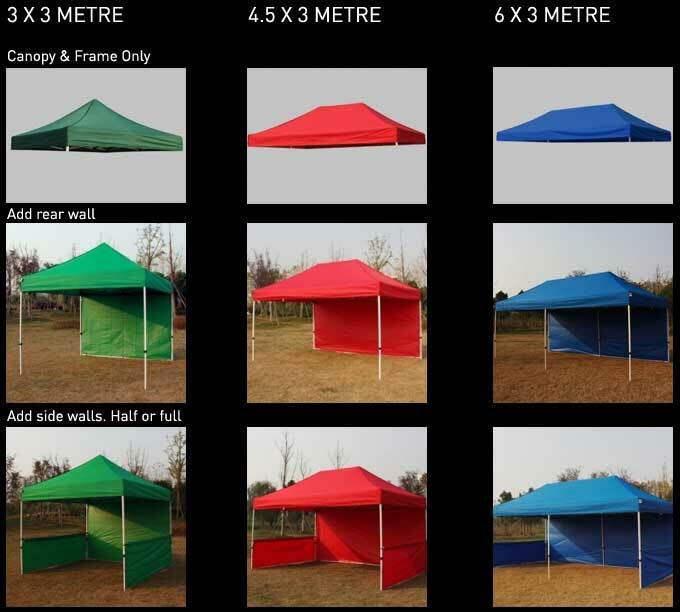 3x6 printed marquee tents are available in attractive colours of red, green, blue black and virgin white. Choose the one of your choice to start advertising your business.